Linen, towels & soaps are provided as well as keys for the private entrance to that room. Linen, towels & soaps are provided. Both rooms with waterfront view are equipped with (secure wifi: sstp), internet 'plug-ins' for laptops and WIFI for smartphones. or directly to my ING bank in Amsterdam. The 15% that you pay to Hostelworld, I will return to you on arrival. Check-in is at 16:00. On Thursdays and Fridays, innkeeper is away in between 17:00 and 21:15. Best is to arrive on these days in between 16:00 and 17.00 or later after 21:15. Check-out is always at 11am. Key deposit is e50.- p person for both rooms. Computer is usually switched off at this time! parking space for luggage at the Eastern side of the Station. Please note that the special houseboat toilet at the houseboat is manned by a pomp and will cause you great problems if 'others' than toilet paper goes down the drain! 1. The Elephant room, a large 'deluxe 3 bed private' with private entrance. This 3-bed private can be booked by a couple or by 2 persons wishing 2 individual beds or by 3 persons. Please let the house know how many persons will be arriving! When 3 guests book the room the third guest pays 40.- per night on arriving at the houseboat. Please see to it that you have the right amount in cash as Arknoa does not accept payment through Master or visa cards. Both rooms face the afternoon sun, the canal and 8 grand beautiful trees on the other side of the canal. The Elephant room is comfortable, attractive, spacey, with books available in the room. the hall next to the smaller Nest room (2p.) and the innkeeper's studio. Please note that there is only one shared bathroom and wc on the boat! Thus showers are best taken once all guests have used the toilet! 2. 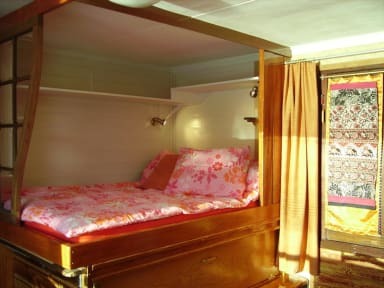 The 'Nest room', a 'basic double bed private''. and the bathroom. 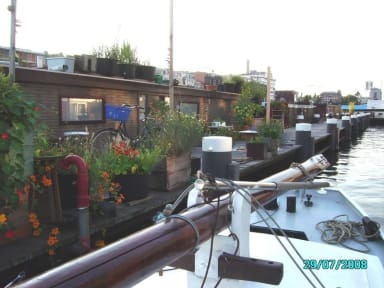 This is a good address for a few nights in Amsterdam, due to location and waterfront view! (Asides 'Innkeeper Rose', only 2 or 3 guests are residing on the boat, variously). Arknoa is close to the supermarket, the Jordaan district, the Ann Frank house & the street markets on Saturdays and Mondays. It is also close to the Westerpark and the farm there with veg . meals; a.o. - Telephone Farm BUURT BOERDERIJ - 0031 20 3376820 - for meal reservations which are served from 18:00 - 20:00. Live music there on Wednesdays and Fridays! Arknoa offers its guests a safe, peaceful and refreshing place to relax in. So welcome to your floating room on the waters and to a good night's sleep! - For LAST MINUTE BOOKINGS be sure to PHONE Rose a.s.a.p! In such cases, please only phone! See also for ferry boat trips to interesting locations &/or restaurants and to the dutch beach ! (One way TRAIN to beach in Zandvoort, via HAARLEM, is 30 min. +/- e8.-). Pour votre bonne information, Rose Noa speaks le francais et un peu d'espagnol. Made Amsterdam such a fun and authentic experience!! The room with 2 beds was perfect. The location is within walking distance of everything so really great for price! The host was absolutely amazing. Our flight didn’t land until midnight and she had tea waiting for us and provided us with raincoats. Great place to stay and a nice change from a hotel room. Room did not have a full door - about 1.5 feet of space at the bottom of the door was completely open to the hallway of the houseboat. The other guests in the boat could have crawled under the door and gone through our things. There was also a cutout in the wall above our bed that opened into the hallway, so we felt we did not have enough privacy and considered leaving. However, the boat was in a great location, Rose was very nice, and we enjoyed sitting in the rowboat outside in the mornings. No security at all, not even the bottom of your door so you could access a room easily and steal what you wanted. Can only shower at certain times. The owner burst in when ever she wants.